Darci is a fairly regular sixteen year old, living in a country town and plays basketball in her free time with her best friend. Her life is abruptly changed when she is accidentally transported to the strange land of Nahaba by a young apprentice wizard called Taslessian. Within hours of her arrival, both are thrust into a dangerous journey to the cave of cave of Grisham the Great that will hopefully result in Darci being returned home. They are both soon to learn that there are no such thing as accidents and their journey is only just beginning. Quest of the Demon has all the hallmarks of the standard high fantasy fare - wizards, dragons and elves etc along with the alternative reality slant that feels very much like Terry Brook's Landover novels. There is a very endearing style to the prose that has a very comfortable and clean feeling, especially appealing to the younger reader. The prose is written in an easy reading manner and the plot moves at a fast enough pace to keep the reader interested. There is an almost innocent appeal to the novel but this also dampens down any real sense of tension - even when the protagonist is faced with mortal peril, an inevitable trade-off though and not one that really damages the reader's experience. There is a nice nod to the young childrens novels "The Faraway Tree" by Enid Blyton which I had all but forgotten but were instrumental in my passion for reading at a very early age, I can see some small influence at work here from those timeless classics. The characters are interesting and described in good detail, I especially liked the way the protagonist was managed with coping in an unknown world full of strange creatures and magical abilities. The interplay between Darci and Taslessian is also very rewarding and is one of the highlights of the novel. The story is fairly straight forward but has a genuinely surprising ending which works very well and lines up nicely for a follow-on novel. 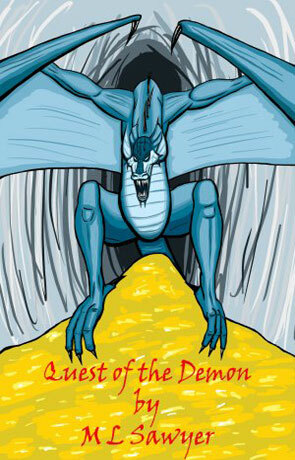 Quest of the Demon is a rewarding high fantasy novel with an uncluttered and unoffending style that should be perfect for the younger reader. Written on 18th April 2011 by Ant.